J. H. SPRADLING, a retired farmer of Mulberry Grove, was born in Maury County, Tenn., August 1, 1828. He is the son of James Spradling, whose birthplace was in the State of Tennessee, and who was reared in that State and came to Bond County, Ill., in 1832. He located in Mulberry Grove Township, where he took up Government land and lived in a log house until the time of his death, at the age of seventy-two years. The mother of our subject, Frances T. Oliver, was a member of the old Virginian family of that name and was reared in that State. She attained to the age of eighty-three years. Mr. and Mrs. Spradling lived peaceful, happy lives, and died mourned by friends and relatives. The family of Mr. and Mrs. Spradling consisted of two daughters and one son, the latter being our subject. Emerantha is the widow of James Riley and resides in Mulberry Grove Township; and Frances J. is the widow of John Segrest, of Mulberry Township. Our subject was the second child, and was four years old when he came to Bond County with his parents. His school experience did not begin until he was several years older, when he attended the log schoolhouse of pioneer days, and the puncheon floor and slab scats of the barren little building will never be forgotten. Air and sunlight were unobstructed, because there was no glass in the window, and the birch trees grew near, so there never was any difficulty concerning a proper amount of discipline. Mr. Spradling was reared to farm work and became thoroughly acquainted with the requirements of the soil and the proper cultivation of the cereals. His mind was not much disturbed by the outside world, for, except at the market towns, there was not much communication in those days, with the great unknown lands east of the State of Illinois, where civilization reigned, and west of it, where there was still a wilderness. The neighbors in those pioneer times were friendly and sociable, and when our subject reached the age of twenty-one years there was no difficulty in selecting a congenial partner for his life journey. The lady of his choice was Miss Cynthia Ann Jackson, a native of Indiana, and the daughter of William Jackson. After his marriage, which took place December 30, 1849, our subject removed to section 25, Mulberry Grove Township, and there built a log house, 16x18 feet, for which he cut the logs himself. That humble abode was for a time the family home. Mr. Spradling was engaged for seven years in the lumber and hardware business at Mulberry Grove. He has a fine farm of two hundred and forty-three acres in Mulberry Grove Township, which he now rents. He also owns a farm of ninety acres in Fayette County, which is well improved with a brick house and good barns. His property in the village is quite valuable. Mr. and Mrs. Spradling became the parents of seven children, two daughters and five sons. John F. died November 25, 1881; Eliza P. is the wife of Joseph Call, a farmer of Fayette County; William II. is an agent and telegraph operator at Pocahontas, Ill.; Albert M. lives in Mulberry Grove; George L. is located on his father's farm in Fayette County; Laura is the wife of Frank Brown, who is in the lumber business in Mulberry Grove; Harry W. is at home. The mother of this family died March 31, 1883. Our subject started with but little means, and now has the satisfaction of knowing himself to be one of the wealthiest men in the township, and his money was not made in speculating, by which one man gets rich at the expense perhaps of a hundred others. He is a Republican now, although before the war he was a Democrat. He was deeply interested in the Underground Railroad and assisted many negroes to reach the land of freedom, Canada. His fellow-citizens regard him with respect and esteem, and have called upon him to act as School Director. His position in the community is one of prominence and importance, and he has done his part toward the upbuilding of Bond County. 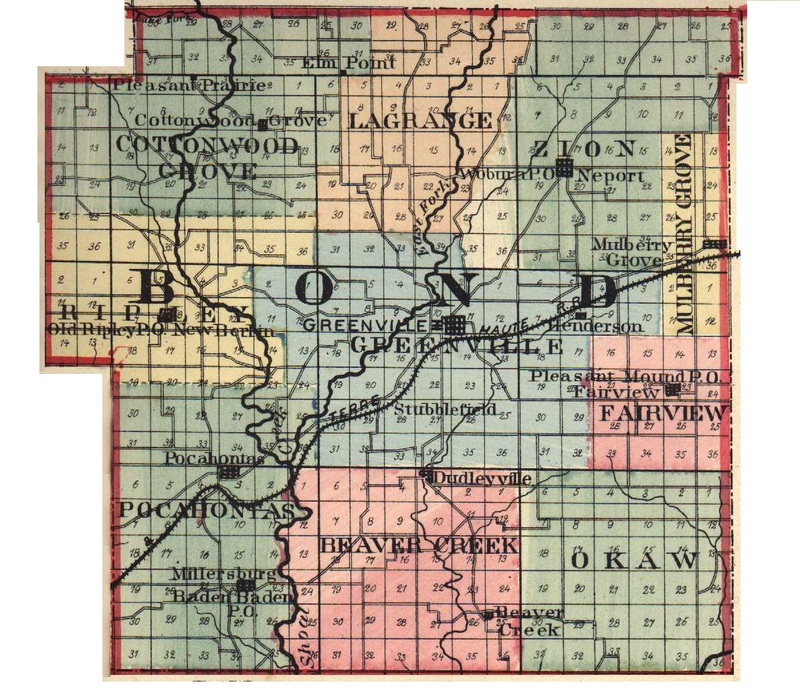 Extracted 04 Dec 2016 by Norma Hass from 1892 Portrait and Biographical Record of Montgomery and Bond Counties, Illinois, pages 260-261.